Yesterday, my fiancé and I hosted our annual “Diet Starts Tomorrow” New Year’s Brunch. I love to host, and events like this give me the chance to bake up some delicious sweets! 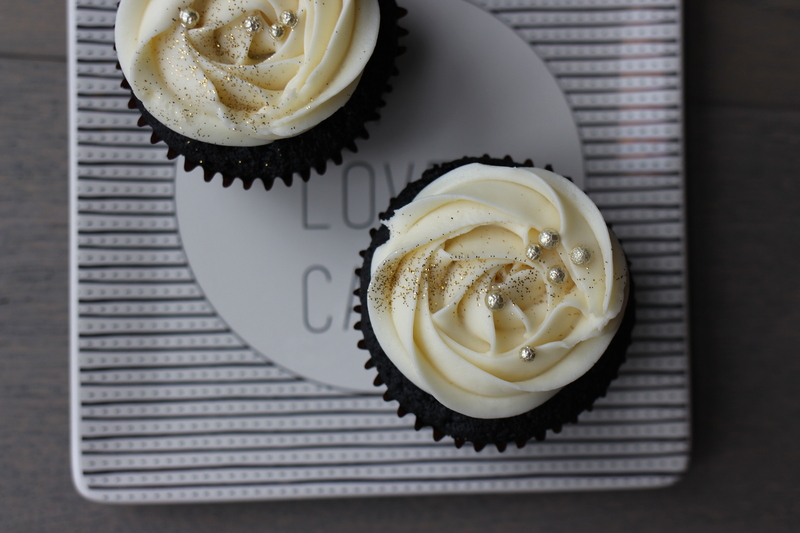 Believe it or not, I’ve been meaning to bake up this exact cupcake for a while now… but I wanted to save it for a New Year-worthy event that would appreciate the black-and-gold schema. 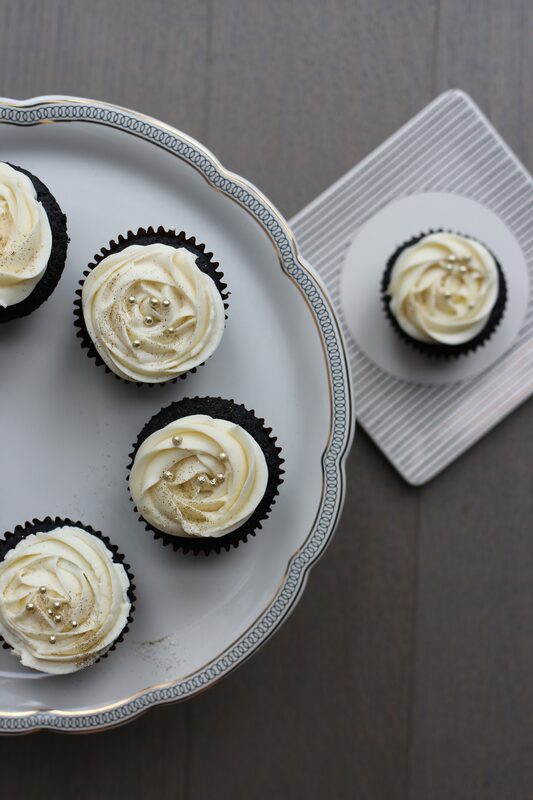 All I can say is that dark chocolate cake and a smooth, cream cheese champagne frosting were meant to be together. And champagne frosting for a New Year’s dessert? Well, I’d say it’s perfection! The combination was absolutely divine and the final product looked pretty fine, too! :) Wouldn’t you say? I think I alone wolfed down a good 4 cupcakes. Oops… but that’s why it’s called the “Diet Starts Tomorrow” brunch! Here’s to wishing you a great start to the year! As always, thank you so much for stopping by and please leave YOUR thoughts in the comments below! What are you most looking forward to this upcoming year, or are there any resolutions you’re looking to accomplish? PS: Aren’t these the most perfect plates that you ever did see?! 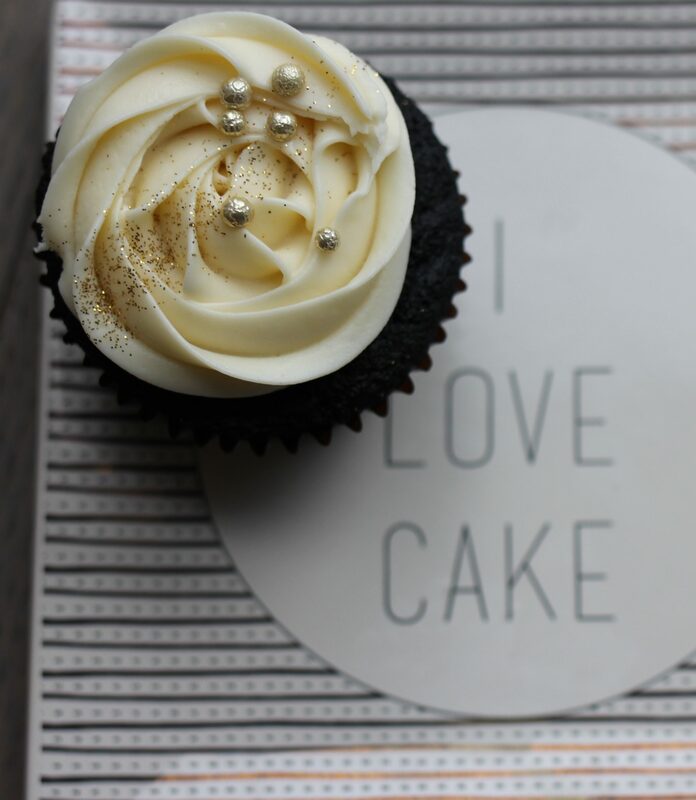 “I love cake”—I can’t think of any other three-word phrase that better describes myself. Thank you, Bina, for the thoughtful and picture-perfect gift! A cupcake creation with rich combination of chocolate and savory-sweet champagne frosting, perfect for any occasion! 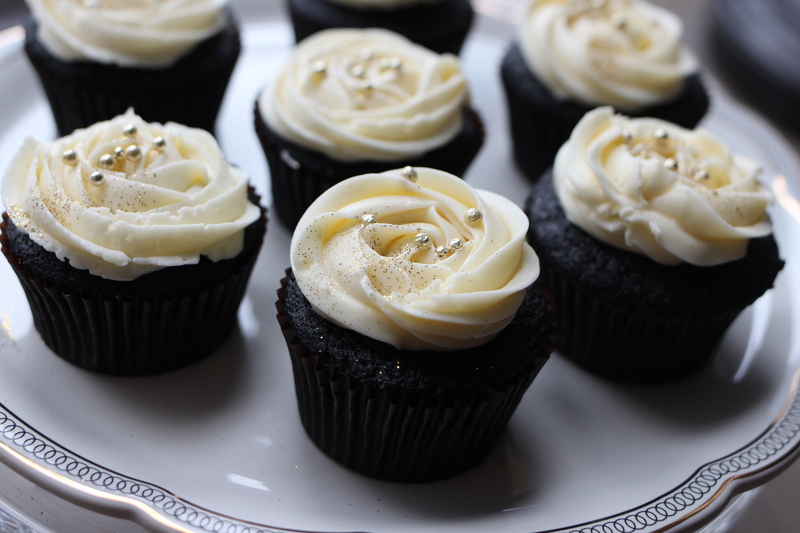 Dressed with a bit of gold dust and sprinkles, this is the perfect dessert companion for a special event! Preheat oven to 350F. Line a cupcake tin with 12 liners. In a small saucepan, heat butter and stout to a boil ensuring all butter is melted. Remove from heat, cool slightly, and whisk in cocoa powder until thoroughly mixed. Set aside to cool slightly. In a bowl, whisk or sift together flour, sugar, baking soda, and salt. Set aside. In a mixing bowl, beat eggs then add yogurt and mix until incorporated. With mixer running on low, pour in cooled chocolate mixture and mix until incorporated. In increments, add in dry ingredients, mixing until just combined. I manually fold in the last addition so as to not overmix. Divide batter among 12 liners, about 3/4 of the way up. Bake 15-17 minutes until center is set, springs back to the touch, and an inserted toothpick comes out clean. Remove from oven and set aside for 5 minutes before moving cupcakes to a cooling rack to cool completely. In a small pot or saucepan, heat 1 cup of champagne and reduce until about 2 Tbs of liquid remains. Let cool. With a mixer, beat together softened butter and cream cheese until fluffy. Add in 1/2 to 1 cup powdered sugar in increments, to taste preferences. Mix in salt, vanilla, reduced champagne, and 2 Tbs of unreduced champagne until smooth and incorporated. Place in pastry bag with fitted tip (I used a #1M Wilton star tip), and pipe a rosette onto completely cooled cupcakes. 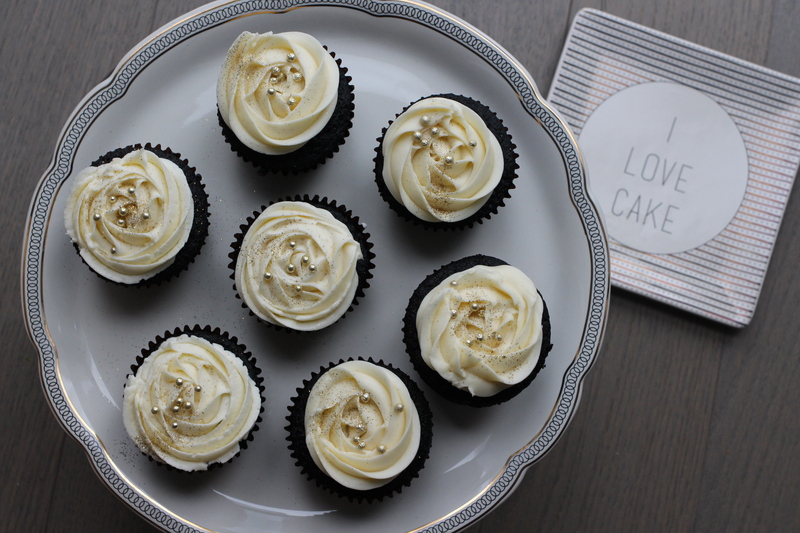 Sprinkle a small amount of gold glitter or dust atop each frosted cupcake. Add 5-7 gold sugar pearls as a finishing touch.